Hal Wilson was born in 1938 in New York. He enlisted in the U.S. Army on January 22, 1959, and after completing basic training and radio operator school at Fort Dix, New Jersey, he served with the 97th Engineer Battalion in Verdun, France, from August 1959 until he returned to the U.S. and left active duty on January 12, 1961, remaining in the Army Reserve until his honorable discharge on December 31, 1964. During this time, Hal completed his bachelor's degree in Aeronautics at St. Louis University, and then worked as an aircraft maintenance engineer on F-4 Phantom II fighters with McDonnell Aircraft Corporation before entering Officer Training School with the U.S. Air Force on May 23, 1965. He was commissioned a 2d Lt on August 13, 1965, and then completed Undergraduate Pilot Training at Laredo AFB, Texas, in August 1966. After completing B-52 Stratofortress Combat Crew Training, Lt Wilson served as a B-52 pilot with the 337th Bomb Squadron at Dyess AFB, Texas, from January 1967 to December 1969, during which time he deployed to Southeast Asia and participated in Arc Light bombing missions over Vietnam. His next assignment was as a B-52 pilot with the 348th Bomb Squadron at Westover AFB, Massachusetts, from January 1970 until he was forced to eject over North Vietnam while on his 4th tour to Southeast Asia and was taken as a Prisoner of War on December 19, 1972. After spending 101 days in captivity, Capt Wilson was released during Operation Homecoming on March 29, 1973. He was briefly hospitalized to recover from his injuries at Westover AFB, and then served with the 58th Tactical Fighter Training Wing at Luke AFB, Arizona, until October 1974. Maj Wilson next served as an FB-111 pilot with the 380th Bomb Wing at Plattsburgh AFB, New York, from October 1974 to June 1978, followed by Air Command and Staff College at Maxwell AFB, Alabama, from June 1978 to June 1979. 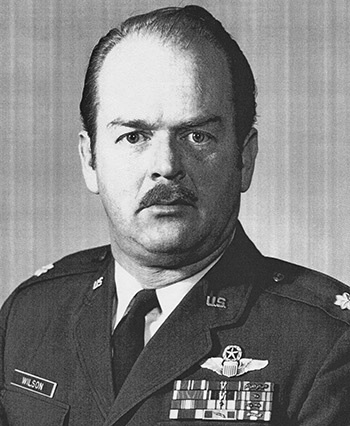 His final assignment was with the Air Force Weapons Laboratory at Kirtland AFB, New Mexico, where he served as Executive Officer of the Advanced Radiation Technology Office and then as Chief of the Nuclear Weapons Technical Data Section from June 1979 until his retirement from the Air Force on May 1, 1985. After his retirement from the Air Force, Hal earned his master's degree in psychology and then worked as a psychotherapist, specializing in Post Traumatic Stress Disorder (PTSD). He has worked in the United States and has trained therapists in Northern Ireland. Captain Hal K. Wilson III distinguished himself by heroism while participating in aerial flight as a B-52 Aircraft Commander near Hanoi, North Vietnam, on 19 December 1972. 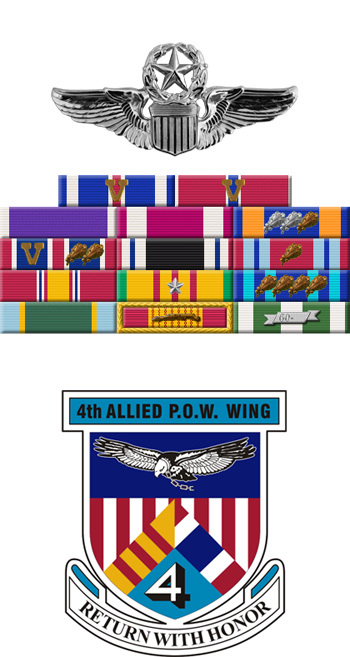 On that date, Captain Wilson participated in a high-priority bombing mission against a vital military target in a heavily-defended area of North Vietnam. Despite the intensity of defensive reaction and extreme hazards posed by numerous surface-to-air missiles and hostile interceptors, Captain Wilson displayed a courageous willingness to place the mission above his personal safety in directing his aircraft to a successful release of his ordnance on the designated target. The outstanding heroism and selfless devotion to duty displayed by Captain Wilson reflect great credit upon himself and the United States Air Force.